Thanks to Jenny Bennie at the Port Elizabeth Museum at Bayworld for taking the time to let me dig through all her old images. Some of this stuff was packed in special plastic bags to ensure that they didn't degrade due to air exposure. Handle with care! I took shots of them with my camera, so the quality is a bit sketchy here and there. 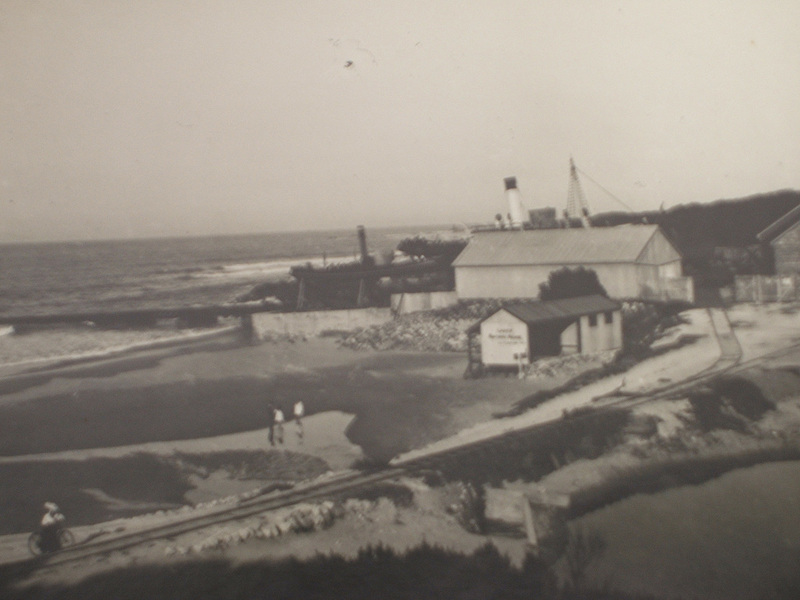 The first shot is of Humewood, taken from where Brookes Pavilion is today and looking down towards where the beach and slipway is today. The building is a hospital for infectious diseases called the Lazaretto! 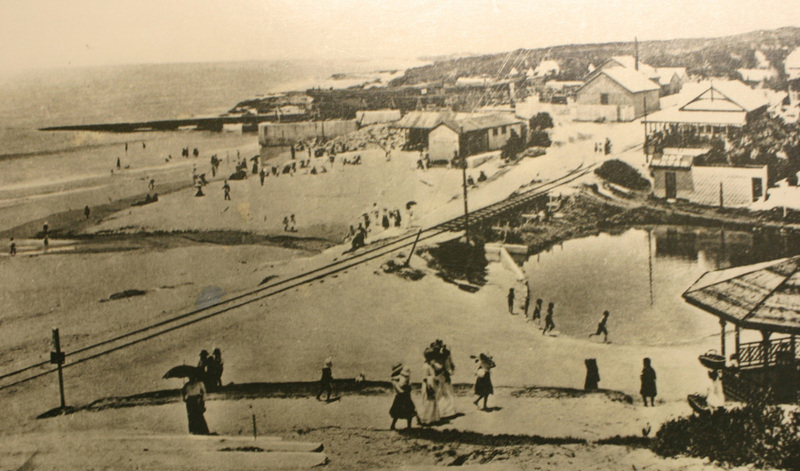 Humewood Beach was as far out of town as you got in those days. The river is the Shark River which was flowing through what today is Happy Valley. It still flows during heavy rains these days. The shot below is taken from the top of the Brickmakerskloof hill area looking down over the Baakens River as it flows into the harbour. No wonder the place floods out when it rains - that was a decent sized river. You can see the beach start just to the right of the harbour wall, which is where the tank farm would be today. 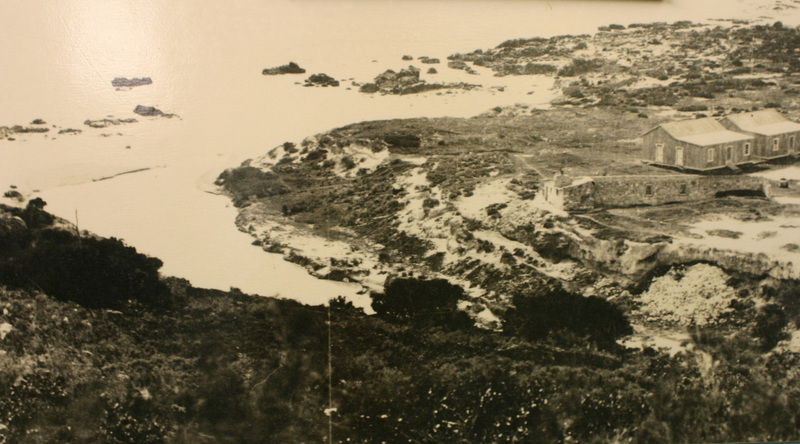 The two shots below show Humewood Beach. The Shark River was still flowing back then. This literally was the "end of the line" as the railway stopped here. It was a small shipbuilding/repair yard. In the 2nd shot you can see a ship pulled up on the slipway. How it used to work was that a ship would sail in between the 6 pillars, and then get pulled up onto the slipway. Again most shots are of Humewood. You can see that a road has been built there now, going across the river. And a few more peeps starting to hang at the beach! The 2nd shot shows what today is (was) Brooke's Pavilion. It became a caravan park for many years in 70's/80's. 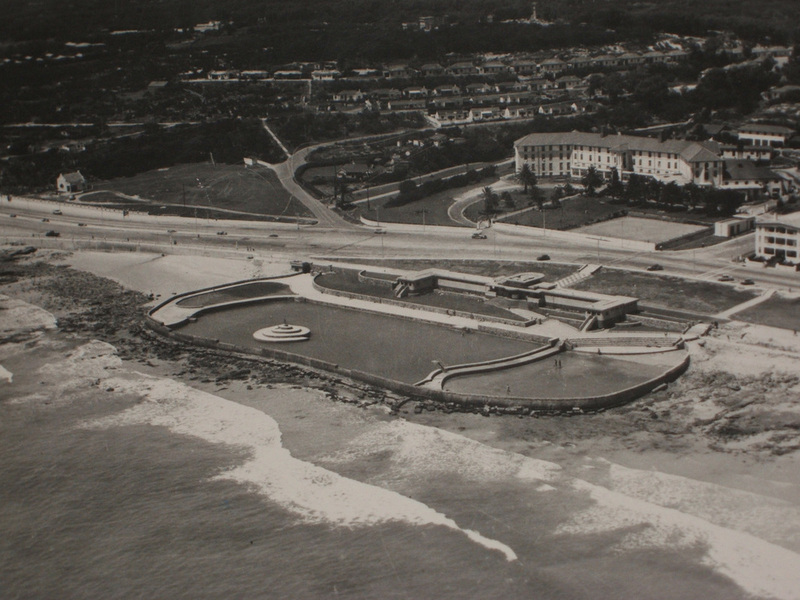 This next shot is taken from pretty much opposite where the Surf Centre/Denvils is today, facing towards Humewood. The building seen on the left used to be a tea room. It stands where today the big open area is at the robots that go up to Brooke's, where the ou's sell all the touristy stuff (from Zimbabwe!) Check out the tram to the right of the picture. A tram's kind of a bus that runs on rails. The shot below is taken standing just before the robots that take you up towards the old Boet Erasmus stadium. Hornby House pictured in the foreground still stands on the corner there today. You can see that to the left is still open space, no McArthur baths yet. Set back just behind Hornby House (where McDonalds is today), is the original Humewood Hotel. It's since become the Garden Court, and moved a bit further back on the property. Things were hotting up by now, cars were more common place - although they all still looked the same! Humewood was still the place to be. This shot is taken standing on the bridge at Hummies, back towards McDonalds. There was a tea room on the left, which got washed away in the floods of 1968. 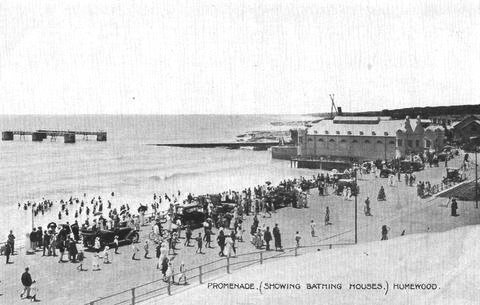 This last shot is of McArthur Baths, taken closer to the middle of the century. The big hotel is the Humewood Hotel. Which became the Elizabeth Hotel, and is nowadays the Garden Court. Check out all the rocks around the pool. 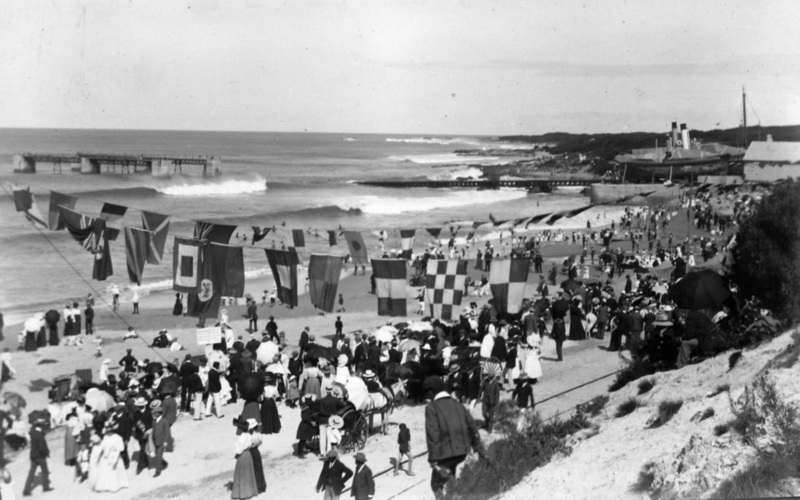 This was before the harbour wall extension was built, so in those day's King's Beach was still pretty narrow. Sand started building up after the wall was extended, and slowly extended the width of the beach right down as far as McArthur - no more rocks round there today. CHECK OUT THE NEXT "BACK IN THE DAY" GALLERY, WHICH IS 1950-1970, HERE.